Trail departs the Skyline Trail just south of Horseshoe Saddle. 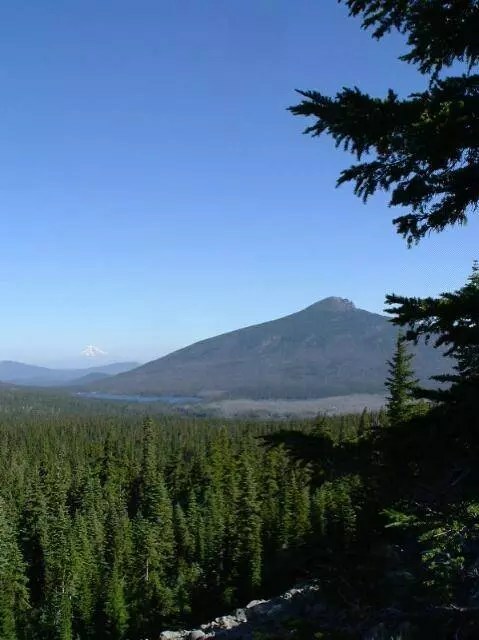 Trail is easy to follow and offers views of the Ollalie Lake District, Ollalie Butte, and Mount Hood. After the Horseshoe Lake overlook begin a gradual descent towards Gibson Lake. Trail maintenance stops at the top of this descent as the trail enters the Reservation at an unmarked boundary nearby. Many of the trails in this area were public until the boundary dispute with the Reservation was settled in the Seventies after years of dispute. The Cambell line was given up for the Mc Quinn line. A longstanding dispute revolved around the identity of the Mutton Mountains and which highpoints were visible from others at the time of the Treaty. Unfortunately, several public trails were affected. A nice walk for campers in the area. Tribal Policy governs the trail’s use on Reservation lands.